Re: ca fait penser a ! 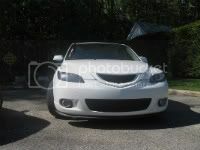 Mazda3 sport GT Blanc perle, 2006, Drop tein STech, Hid 8000k basse et fog, Mag mazdaspeed3, Open mouth, eyelids, Cat-back Corksport, Coldair intake, vitre teinter, angel eyes, konie yellow! ma voiture est a vendre! 514-755-5615!